These two stylish machines can trace their ancestry back to Kyocera, Japan. They are in fact, siblings. The Model 100 (top) made the biggest impact in Western countries where, branded and distributed by Tandy, it became famous as the journalist friend. In fact, these computers were useful to anyone who needed to word process on the go. They had all the right credentials for this activity. 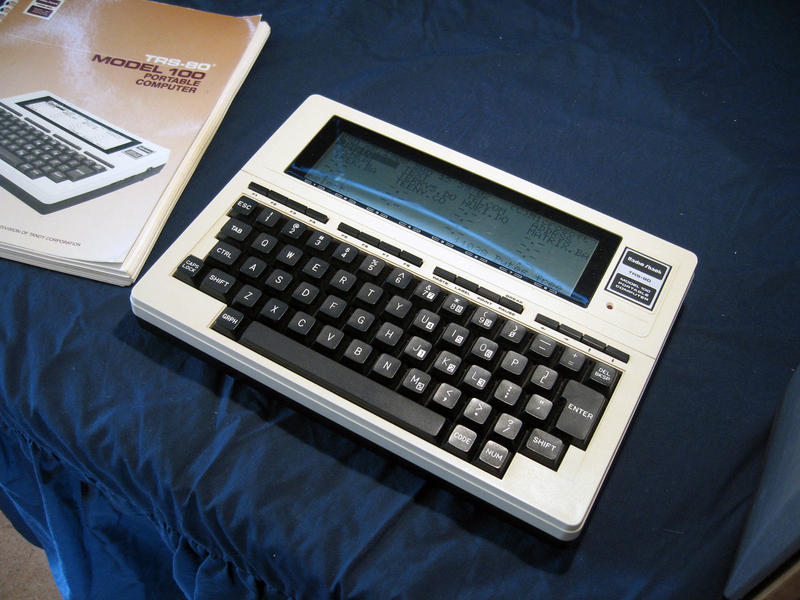 They were light, small (the footprint of an A4 page), had a great tactile keyboard, a simple-to-use built-in text editor (among other things) and great communication facilities. No messy floppies to worry about as everything was kept in RAM, until it could be uploaded to a larger machine! What's more they could keep going for hours on the smell of coffee and a few donuts! (or rather, 4 AA batteries). This was in the days when most portables (the Epson HX-20 aside) needed an AC socket in easy reach, being huge luggables the size of a large sewing machine and twice as heavy! 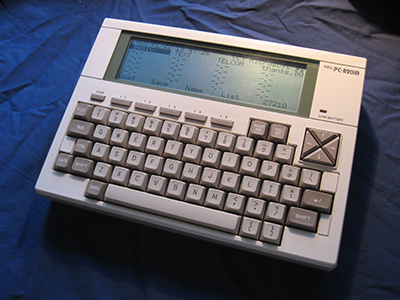 Both models featured a special low-powered version of the 8085 chip, and a special 8 line x 40-character LCD screen. The Model 100 could stack away 32k worth of information while the NEC 8201a could be upgraded to a whopping 96k! Augmented with a real-time clock, a superior version of Microsoft BASIC (the last piece of GatesCode) and ports galore, the micros in the pictures sold well. The Model 100 is one of 6 million units sold worldwide! Both computers have worn the years well, and they look practically out of the box! The NEC had some issues originally but now everything is in full working order. I can get BASIC software off the Web and easily transfer it in via RS-232 with a utility program, so they are never lonely. The Model 100 has it's own manual, and signature black carry case. The NEC has a case and the three original manuals. At a later date from another source I was gifted the original data cassette recorder and software that was sold with it. I have a soft spot for the NEC PC-8201a having owned one from 1985-1987. It was great! Click here for more information and a comparison between the two. Innovative and just plain cool, both these computers are valued members of the collection. Want to know more about these micros? Google is your friend.